Demande de prix Emballage flexible avec bouchon? 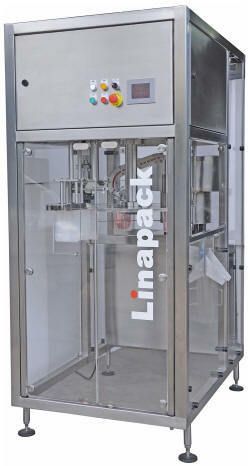 The LINAPACK LFC machine range for filling and capping premade pouches with corner or center spout as well as side gusset bags with spout has been designed for the user peace of mind and a hygienic high quality production. These machines are suitable for a wide variety of liquid and viscous products such as food and beverage, detergents, cosmetics, chemical products, etc. Pouch loading: In semi-automatic operation, the pouches are fed by the operator, the machine then handles the filling, capping and discharge operations. A rack system that can hold up to 600 pouches can be attached to the feeding station for automatic operation. Filling: The diving nozzle sits on the spout to ensure an air tight seal during filling for a proper pouch expansion. The dosing pump is placed externally to the machine for easy cleaning. Spout cleaning: Hot filled foamy product may require the spout to be cleaned prior to capping. The spout is closed by a cone while water is sprayed from two sides. Cap placing: The caps are fed by a vibratory or rotary sorter to a chute that places the cap accurately on the spout. Cap screwing: The cap is tightened by a rotating capping head with independent variable speed motor and adjustable magnetic torque control. Pouch discharge: The pouches are discharged on a chute for delivery to a conveyor or a collection table. Collection of rejected pouches (optional): To reduce machine stoppage, faulty pouches can be collected separately. The Linapack LFC 300-2x is particularly suited to food and beverages small pouches. The LFC 600 and LFC 3000 are more versatile versions with a wider pouch size range. See our dosing units for liquid products. This machine range is suitable for stand-up pouches (doypack) with corner or center spout, side gusset bags with spout and other pouches with spout. See also our fill and seal machines for other types of stand-up pouches. Semi-automatic or automatic operation by addition of modules. Hygienic design with no part below the pouch level and no lubrication needed on the outside machine parts. Completely wash down safe, stainless steel and engineering plastics construction. Accurate and smooth rotary table motion. Complete access granted to all machine parts for quick and easy change over of spout size and easy maintenance. User friendly setting done via touch-screen. No pouch - no fill and no cap – no discharge safety features. Quality and commonly available components chosen from well reputed international companies. Linapack also supplies all kinds of exit conveyors and accumulation/packing tables according to the end user requirements. Sets of change parts for different caps or spouts. Automatic pouch loading from rack system. Various dosing pumps according to the product and filled volume. Sorters for special cap shapes. Automatic cap refilling in sorter by external feeder. Jacketed hopper for hot filled products.